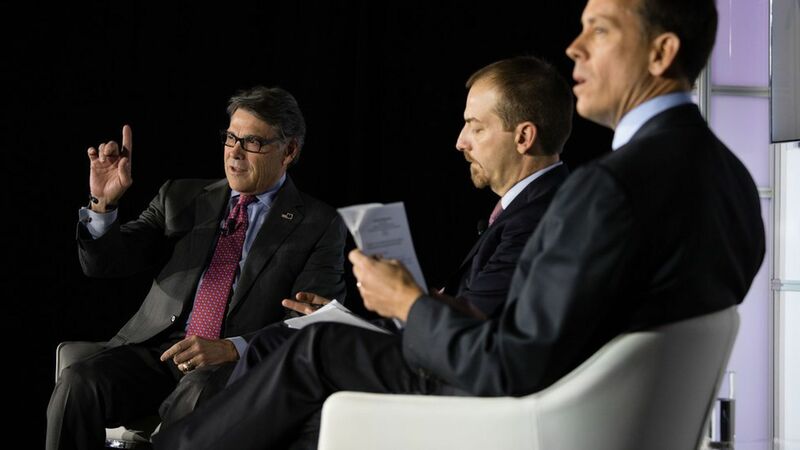 Energy secretary Rick Perry said at our Axios and NBC event Thursday morning that fossil fuels can help prevent sexual assault. Our thought bubble: Perry's comments, which got picked up by numerous other media outlets, came off as inarticulate and opened him up to a barrage of criticism that he was both inaccurate and insensitive to victims of sexual assault. The underlying point he was implying — fossil-fuel powered electricity helps ensure safety — is a valid though too narrow point. Gritty details: Perry recounted a story from a recent trip he took to Africa and said it would take fossil fuels to prevent sexual assault there. (His full comments are copied below.) What would have been a fairer comment is to say it takes electricity access (powered by whatever fuel) to ensure safety by providing light in otherwise dark places. People interpreted his comments as him using sexual assault as a way to tout fossil fuels over other resources like wind and solar. Fossil fuels remain the cheapest option for electricity in many parts of the world, but renewables are catching up. In fact, a top energy analyst recently predicted large swaths of Africa could be powered by renewables (and natural gas) instead of coal. The Trump administration has consistently prioritized fossil fuels over renewables and is run by a president who has faced several allegations of sexual harassment, so connecting the two did not sit well with many people. For the record: "The Secretary was making the important point that while many Americans take electricity for granted there are people in other countries who are impacted by their lack of electricity," a spokeswoman for Perry said by email. Andy Revkin, longtime climate change reporter, defended Perry's comments in a series of tweets. "I just got back from Africa, I'm going to finish up with this, because I think I heard a lady say there are people dying. Let me tell you where people are dying, is in Africa, because of the lack of energy they have there. And it's going to take fossil fuels to push power out into those villages in Africa, where a young girl told me to my face, 'one of the reasons that electricity is so important to me is not only because I'm not going to have to try to read by the light of a fire and have those fumes literally killing people.' But also from the standpoint of sexual assault. When the lights are on, when you have light that shines, the righteousness, if you will, on those types of acts. So from the standpoint of how you really affect people's lives, fossil fuels is going to play a role in that. I happen to think it's going to play a positive role."